Far-right activists from Britain First and the English Defense League (EDL) gathered to oppose radical Islamist preacher Anjem Choudary, whose supporters were handing out leaflets urging Muslims not to vote, outside the London Central Mosque. 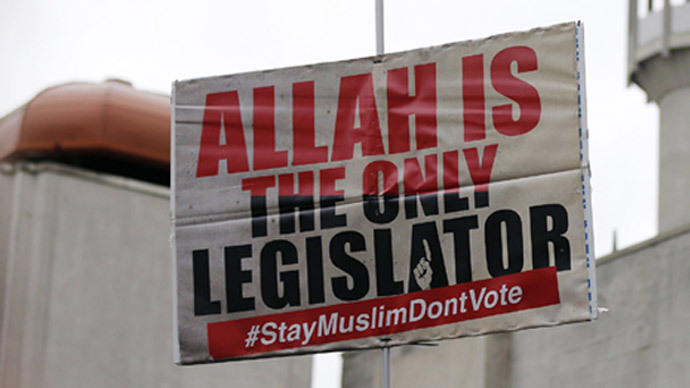 Around 100 members from the two far-right groups gathered outside the London Central Mosque and the Islamic Cultural Center in central London as Muslims entered the building to observe Friday prayers or Jumu-ah. The nationalists were waving Union and St. George’s flags and some of them were dressed in niqab veils and pig head masks as they chanted anti-Islamic messages. Several EDL memebers sang “it’s our country, we’re taking it back” to the tune of The Beach Boys’ Sloop John B, while others went for the more creative approach and just shouted “scum”. There were as many policemen at the scene as protesters, and around 100 officers made sure the members of the EDL and Britain First were kept well away from those people coming out of the mosque. “Only God can make things lawful and unlawful. If a human being does this…this is considered the most heinous crime,” one passage reads, as cited by London Evening Standard. People who spoke to the British press seemed more bemused or indifferent than offended at the far-right’s protest, including Muslims at the scene. “It’s a mosque. People come here to pray and to be honest all that they are doing is making it hard for people to come and go. We should be trying to live together,” said Mohamed Drali, a young Egyptian immigrant, as quoted by the Guardian. While others were also disdainful of the message Choudary was pushing. “It’s completely the wrong message they are putting out. It’s also incredible that they – both them and the ones of the other side of the street - are doing this on this Friday. It’s important to both us, Christians and Jews. We should be together on a day like this,” Ahmed Dogan, an architect originally from Turkey, told the Guardian. Britain First is trying to displace the British National Party as the standard bearer of the far-right. Earlier their leader, Paul Golding, likened the scene to Rorke’s Drift from the 1964 feature film Zulu, which depicts a battle between the British Army and the Zulus in January 1879, although the Zulu’s were an African tribe with no connection to Islam. “We were here last year too. It was like Rorke’s Drift…just us in the middle of thousands of angry Muslims,” he said.